Finding time for creativity is something a worship leader may have to juggle with 50- to 60-hour work weeks, leading a family and spending time with friends. That’s before the unexpected, often life-altering moments that bring chaos to our usual routine — deaths, sicknesses, arguments with our spouses, kids going wild. Often we are caught playing defense, unprepared for “this,” and trying to salvage what was our normal. 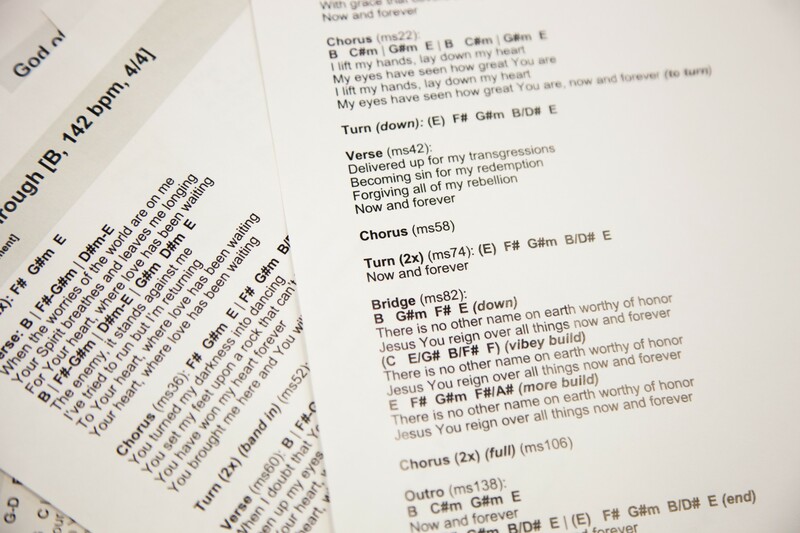 Great songs connect our need for God to our testimony that God has used, or our belief that He will use, our circumstances for His glory and our good. Think about all the songs you’ve played on repeat over the years. I promise this is the consistent theme in all of them. The “good” that God works for us in Romans 8:28 isn’t necessarily what we define as good, but rather what will make us, ultimately, the person God intends us to be. I dare say God allows us to go through struggles because the “purpose we are called to” is writing songs to strengthen people struggling to find faith in a life-altering moment. Faith is what great songs are made of. I learned this last year when my wife and I found out we were pregnant with our first child. At the first ultrasound appointment, the doctors found two cysts on our baby’s umbilical cord. We were crushed, asking God why he would give us a blessing, only to have it potentially taken from us. Since its release, I’ve heard many stories from people in crushing situations like ours. Singing the words, “You brought me here, and you will see me through,” built faith and trust in them that God is working things out exactly as He planned so they reflect the image of Christ. Songwriters need the audacity to see life as a story God is writing. Life’s crucial moments are blessings to us and opportunities to use our God-given creativity to write songs for others to see Jesus clearer. Hebrews 11:6 says, “Without faith, it is impossible to please God.” Let’s allow God to build our faith because the greater our faith is, the more faith we can inject into our songs.